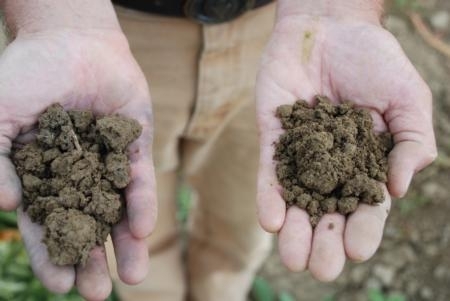 Conservation tillage soil on right and standard tillage soil on left. 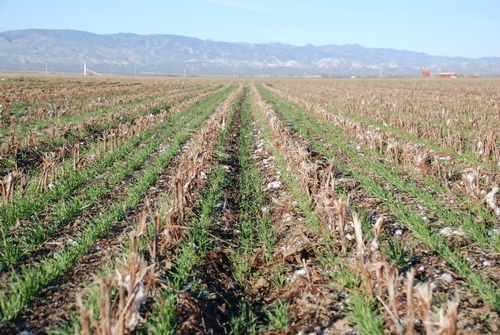 California’s Conservation Agriculture Systems Institute (CASI) has prepared its survey of tillage management acreage for 2010. This tillage survey was conducted as an ongoing comparison of annual row crop acreage that is farmed under different tillage systems throughout the Central Valley region of California. Over 35 local NRCS, University of California and private sector experts were surveyed and results were compared with 2010 county agricultural commissioner cropland acreage. Previous surveys have been conducted in 2004, 2006 and 2008. Data in this survey were compiled for two general types of conservation tillage. Tillage practices such as no-till, strip-till, ridge-till and mulch-till, that leave at least 30 percent of the residue from previous crops in place on the soil surface are the typical forms of conservation tillage that are recognized throughout the world. In addition to these practices, “minimum tillage” practices that reduce the overall number of tillage passes by at least 40 percent relative to what was done in 2000, are also included in the institutes’s tally of conservation tillage acreage. In 2010, conservation tillage systems accounted for about 14 percent of the acreage for the crops that were surveyed including silage and grain corn, small grains for hay, silage and grain, tomatoes, cotton, dry beans, and melons throughout the nine-county Central Valley region. This was an increase from about 10 percent in 2008. Minimum tillage practices were used on about 33 percent of crop acreage in 2010, also up from about 21 percent in 2008. The largest change in conservation tillage acreage over the 2004–2010 period is found in the amount of corn silage acreage that uses strip-tillage. In 2004, there were only about 490 acres of summer silage corn using strip-till, while in 2010 more than 103,000 acres throughout the San Joaquin Valley dairy region had adopted the use of this form of conservation tillage. The overall use of minimum tillage practices has also greatly increased during this time from about 64,000 acres under reduced pass tillage in 2004 and just over 700,000 acres under minimum tillage in 2010. For additional information and photos of various forms of conservation tillage, please contact Jeff Mitchell at (559) 303-9689 or mitchell@uckac.edu . 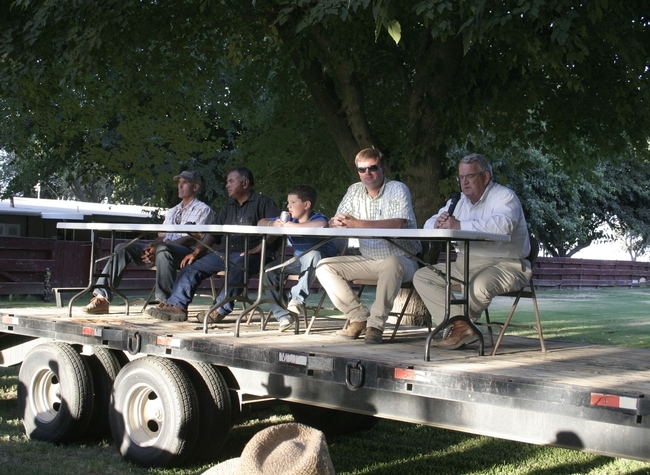 The Conservation Tillage and Cropping Systems Workgroup has launched a new radio podcast to provide farmers information about adopting conservation tillage techniques at their operations. Researcher Jeff Mitchell introduces the CT podcast. Farmer Dino Giacomazzi talks about getting started in CT.
After 10 years of experimentation, researchers at the University of California’s Westside Research and Extension Center in Five Points, Calif. have worked out a number of the “kinks” in conservation tillage (CT) practices for cotton and tomato rotations. “Completely new crop production paradigms pose inherent challenges and risk and the adoption of these new systems is not easy,” reports UC Davis research team leader Jeff Mitchell. The team, composed of Will Horwath, Karen Klonsky, Wes Wallender and Randy Southard out of UCD, Dan Munk and Kurt Hembree out of local Fresno County Cooperative Extension office, and Anil Shrestha from Fresno State, has made steady progress over the years and their research is now shedding light on a number of promising practices for these two stalwart San Joaquin Valley (SJV) crops. The first few years of the team’s work in CT farming systems weren’t too encouraging. The standard tillage methods initially were better in terms of yield. Mitchell and colleagues, however, didn’t become discouraged as they knew that conservation tillage has been used in other parts of the country – mainly in the Midwest and Southeast – with success and yields comparable to those achieved using conventional, intensive tillage. However, these areas of the U.S. traditionally experienced much soil erosion due to a lack of protective soil cover during their rainy, establishment period for their crops. The cropland in the San Joaquin Valley is much different from that of the Midwest and Southeastern U.S. It has generally been leveled for surface irrigation and concerns about soil erosion have not been a major driver for conservation tillage practices in the SJV. In recent years, however, increased fuel prices, labor needs and dust regulations have provided the incentives for renewed interest in conservation tillage. A variety of “minimum tillage” approaches that put together various tillage operations – such as ripping, disking and ring-rolling – are now being widely used throughout the central SJV, according to Mitchell. These approaches, however, simply rely on combining tillage passes and do not necessarily reduce the overall volume of soil that is disturbed. There have been no cropping systems developed and used in the SJV to evaluate the capability of the more classic forms of CT management, such as no-tillage and strip-tillage to further reduce production costs or to increase soil carbon sequestration over time, as has been reported in other regions where these more severe forms of CT are used. Additionally, because successful CT systems such as no-till and strip-till have been widely used in other parts of the country for a number of the crops commonly produced in the SJV, the research team reasoned that the principles of conservation tillage should work here as well. Most CT is currently employed in production regions with higher rainfall or with growing-season precipitation. 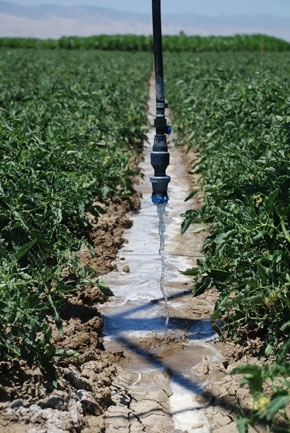 The semi-arid SJV annually receives only about 7 inches of rainfall and thus agriculture relies largely on surface or gravity irrigation. Surface irrigation would likely be more difficult across or through residues that tend to accumulate in CT fields and this has been one of the things studied by the team. The long-term tillage systems work of this team began in 1999 to evaluate CT tomato and cotton systems with and without winter cover crops. It has evaluated impacts of these practices on yield, production costs and soil carbon. The first four years of cover crops didn’t see any increase in total soil carbon, but rather, a shift in the distribution of the carbon throughout the profile was detected. The amount of carbon in the topsoil (0-6”) increased and the carbon in the subsoil (6”-12”) decreased. However, after eight years of following these four systems, the conservation tillage with cover crop (CTCC) had significantly more organic matter and the standard tillage without a cover crop (STNO) – the type that is most used in the San Joaquin Valley – had the lowest amount. For the first year, the cover crops were irrigated up, but after that, they relied on winter rainfall for moisture and, as could be predicted, the amount of cover crop biomass produced and surface residue generated covered a greater percent of the area with greater rainfall. The conservation tillage plots had 10 times the ground covered than the standard tillage plots. Yields for tomatoes after the first two establishment years of the CT systems were almost 10 percent higher than the standard tillage system and the cover crop systems were almost 6 percent than the non-cover crop systems. 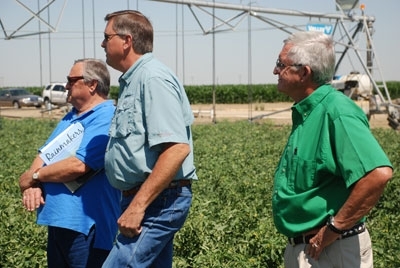 The tomato yields were comparable to the typical yields (9-year average = 36.8 tons/ac) in Fresno County. Cotton production, however, presented a different story. In the last four years of the continuing conservation tillage and cover crop study, the cotton yields were not significantly different between the standard tillage method and the conservation tillage method, but earlier in the study, difficulties with cotton stand establishment resulted in generally lower cotton yields in the CT systems. About half the number of tillage passes were used in the CT systems relative to the standard till practices. For tomatoes without a cover crop, tillage passes went from 19 to 11. For cotton, tillage passes went from 19 for the standard tillage down to 11 using CT. That’s almost a 50 percent reduction of tillage passes for tomatoes and a 40 percent reduction in cotton. There are many benefits that may be gained from both conservation tillage and cover cropping and a growing number of Valley farmers are now beginning to develop successful systems using these practices at a commercial scale. 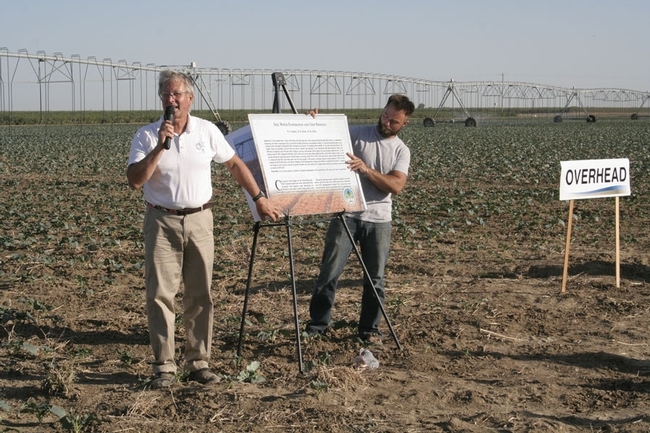 More information on this research and these systems is available at the Conservation Tillage and Cropping Systems Workgroup’s website at http://ucanr.org/ct.